Join us for the Toronto launch of a unique book: Free Public Transit – And Why We Don’t Pay to Ride Elevators . Edited by Judith Dellheim of Germany’s Rosa Luxemburg Foundation and Jason Prince, of Concordia University in Montreal. It is a collaborative result of an international network of scholars and activists working for fare-free public transit. The book includes overall analysis of public transportation and describes and discusses various efforts in cities around the world to build movements for decommodified and accessible public transport. Examples include Toronto, Montreal, Bologna, Hasselt, Tallinn Stockholm and others. 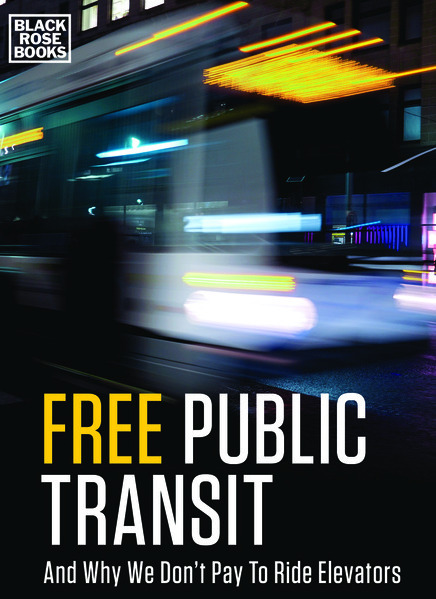 The launch will feature a discussion about the promises, challenges and social underpinnings of free public transit and will include co-editor Jason Prince, author Herman Rosenfeld, and transit activists in Toronto. Co-sponsored by Free Transit Toronto, Centre for Social Justice, Socialist Project.